Red pumpkin or Lal bhopla is poor man's source of carotene in India. Red pumpkin, however, is 'in season' throughout the year unlike in the Western countries, where it is typically an autumn appearance. The glycemic index of raw pumpkin is 75 and the glycemic load of 1 cup of chopped raw pumpkin is 4.2. Is Red Pumpkin safe for diabetics? Carbohydrates present in 1 serving size plays a major in understanding the glycemic load of the food item. Even though the glycemic index of pumpkin falls under high GI category, because of low carbohydrates in 1 cup of chopped raw pumpkin (around 5.7 grams), its glycemic load appears to be around 4.2 which is drastically low. Thus even after having 1 cup of pumpkin, your blood sugar levels won’t fluctuate instantly. Being low in sodium and high in potassium content, pumpkin plays an important role in maintaining your blood pressure. Try to minimize your sodium intake by eating that contains little salt. It is extremely rich in beta-carotene which is a powerful antioxidant. Beta-carotene offers protection against heart disease. It also helps in preventing degeneration of eyes. Is Red Pumpkin suitable for weight loss? Being extremely low in calories, pumpkin is an ideal option for the weight watchers. 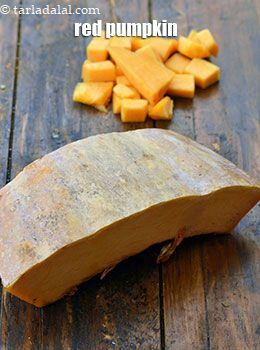 In fact, 1 cup of chopped raw pumpkin provides 32 calories and thus perfectly fits into your weight loss diet plan. Pumpkin also has negligible amounts of fats which is add on benefit. It is important to notice that there is no food available which instantly lead to weight loss. Burning more calories than your consume can help you get better results. Try replacing low calorie vegetables such as pumpkin over unhealthy calorie laden foods. The fiber content in pumpkin helps in making you feel satiated for a longer period of time.